I’ve been reading a lot of apocalyptic-type books, probably because that’s what I’ve been writing as well. I knew of William Forstchen for his Civil War alternate history books, but haven’t read his stuff recently. He didn’t disappoint me before, and he doesn’t do it here. 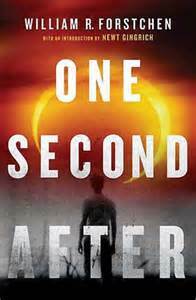 The story consists of a small North Carolina town that survives an EMP attack against the United States. Forstchen does a good job of not only portraying what life would be like in the first few days, but in weeks and months afterward. Some of the issues that come up, such as overpopulation, lack of food and medicine, lack of water and sanitation, and feudal warfare between communities are things most people don’t think of. In addition, they bring out the fact that a large percentage of our population is on mood-stabilizing drugs, so coming off those medications will create problems. One thing that hadn’t occurred to me was that older vehicles, because they didn’t have electronics in them, would be immune from an EMP blast. Forstchen has a PhD with specializations in military history and the history of technology, so you can imagine that both of these come into play. His protagonist is John Matherson, a retired U.S. Army colonel who retires when his wife is diagnosed with cancer. He pulls strings and gets a job teaching history in a small college in North Carolina, very near where his wife’s parents live. She dies, and he decides to stay and raise his daughter there. His daughter has type 1 diabetes, which comes into play in a big way in the story. All in all, the story is entertaining, thought-provoking, and my kind of book. I like a book that raises questions that aren’t easily answered, with characters you really care about. I give it 4 1/2 stars.